A few years ago, a group of Alaska Native elders and educators was assembled to identify ways to more effectively utilize the traditional knowledge systems and ways of knowing that are embedded in the Native communities to enrich the school curriculum and enliven the learning experiences of the students. After listening for two days to lengthy discussions of topics such as indigenous world views, Native ways of knowing, cultural and intellectual property rights and traditional ecological knowledge, an Inupiaq elder stood up and explained through an interpreter that he was going to describe how he and his brother were taught to hunt caribou by their father, before guns were commonplace in the upper Kobuk River area of northern Alaska. The elder described how his father had been a highly respected hunter who always brought food home when he went out on hunting trips and shared it with others in the village. One day when he and his brother were coming of age, their father told them to prepare to go with him to check out a herd of caribou that was migrating through a valley a few miles away. They eagerly assembled their clothing and equipment and joined their father for their first caribou hunt. When they reached a ridge overlooking the nearby valley, they could see a large herd grazing and moving slowly across a grassy plain below. Their father told his sons to lay quietly up on the ridge and watch as he went down with his bow and arrows to intercept the caribou. The boys watched as their father proceeded to walk directly toward the caribou herd, which as he approached began to move away from him in a file behind the lead bulls, yet he just kept walking openly toward them. This had the two brothers scratching their heads wondering why their father was chasing the caribou away from him. Once the father reached the area where the caribou had been grazing, he stopped and put his bow and arrows down on the ground. As the (now) elder told the story, he demonstrated how his father then got into a crouching position and slowly began to move his arms up and down, slapping them against his legs as though he were mimicking a giant bird about to take off. The two brothers watched intently as the lead bulls in the caribou heard stopped and looked back curiously at their father’s movements. Slowly at first, the caribou began to circle back in a wide arc watching the figure flapping its wings out on the tundra, and then they began running, encircling their father in a closing spiral until eventually they were close enough that he reached down, picked up his bow and arrows and methodically culled out the choice caribou one at a time until he had what he needed. He then motioned for his sons to come down and help prepare the meat to be taken back to the village. As the elder completed the story of how he and his brother were taught the accrued knowledge associated with hunting caribou, he explained that in those days the relationship between the hunter and the hunted was much more intimate than it is now. With the intervention of modern forms of technology, the knowledge associated with that symbiotic relationship is slowly being eroded. But for the elder, the lessons he and his brother had learned from their father out on the tundra that day where just as vivid when he shared them with us as they had been the day he learned them, and he would have little difficulty passing a graduation qualifying exam on the subject 70 years later. The knowledge, skills and standards of attainment required to be a successful hunter were self-evident, and what a young hunter needed to know and be able to do was both implicit and explicit in the lesson the father provided. The insights conveyed to us by the Inupiaq elder drawing on his childhood experience also have relevance to educators today as we seek ways to make education meaningful in the 21st century. 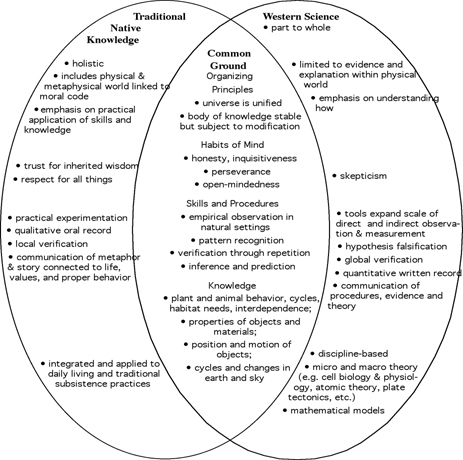 It is to explicating such relevance that the remainder of this article will be directed through a close examination of common features that indigenous knowledge systems share around the world, followed by a closer look at some of the initiatives that are contributing to the resurgence of Alaska Native knowledge systems and ways of knowing as a catalyst for educational renewal. Indigenous peoples throughout the world have sustained their unique worldviews and associated knowledge systems for millennia, even while undergoing major social upheavals as a result of transformative forces beyond their control. Many of the core values, beliefs and practices associated with those worldviews have survived and are beginning to be recognized as having an adaptive integrity that is as valid for today’s generations as it was for generations past. The depth of indigenous knowledge rooted in the long inhabitation of a particular place offers lessons that can benefit everyone, from educator to scientist, as we search for a more satisfying and sustainable way to live on this planet. Actions currently being taken by indigenous people in communities throughout the world clearly demonstrate that a significant “paradigm shift” is under way in which indigenous knowledge and ways of knowing are beginning to be recognized as consisting of complex knowledge systems with an adaptive integrity of their own (cf. Winter, 2004 special issue of Cultural Survival Quarterly on indigenous education). As this shift evolves, it is not only indigenous people who are the beneficiaries, since the issues that are being addressed are of equal significance in non-indigenous contexts (Nader 1996). Many of the problems that are manifested under conditions of marginalization have gravitated from the periphery to the center of industrial societies, so the new (but old) insights that are emerging from indigenous societies may be of equal benefit to the broader educational community. …Indigenous societies, as a matter of survival, have long sought to understand the regularities in the world around them, recognizing that nature is underlain with many unseen patterns of order. For example, out of necessity, Alaska Native people have made detailed observations of animal behavior (including the inquisitiveness of caribou). They have learned to decipher and adapt to the constantly changing patterns of weather and seasonal cycles. The Native elders have long been able to predict weather based upon observations of subtle signs that presage what subsequent conditions are likely to be. The wind, for example, has irregularities of constantly varying velocity, humidity, temperature, and direction due to topography and other factors. There are non-linear dimensions to clouds, irregularities of cloud formations, anomalous cloud luminosity, and different forms of precipitation at different elevations. Behind these variables, however, there are patterns, such as prevailing winds or predictable cycles of weather phenomena that can be discerned through long observation (though global climate change is taking its toll on weather predictability). Over time, Native people have observed that the weather’s dynamic is not unlike the mathematical characteristics of fractals, where patterns are reproduced within themselves and the parts of a part are part of another part which is a part of still another part, and so on. For indigenous people there is a recognition that many unseen forces are at play in the elements of the universe and that very little is naturally linear, or occurs in a two-dimensional grid or a three dimensional cube. They are familiar with the notions of conservation of energy, irregularities in patterns and anomalies of form and force. Through long observation they have become specialists in understanding the interconnectedness and holism of our place in the universe (Barnhardt and Kawagley 1999; Cajete 2000; Eglash 2002). The new sciences of chaos and complexity and the study of non-linear dynamic systems have helped Western scientists to also recognize order in phenomena that were previously considered chaotic and random. These patterns reveal new sets of relationships which point to the essential balances and diversity that help nature to thrive. Indigenous people have long recognized these interdependencies and have sought to maintain harmony with all of life. Western scientists have constructed the holographic image, which lends itself to the Native concept of everything being connected. Just as the whole contains each part of the image, so too does each part contain the makeup of the whole. The relationship of each part to everything else must be understood to produce the whole image. With fractal geometry, holographic images and the sciences of chaos and complexity, the Western thought-world has begun to focus more attention on relationships, as its proponents recognize the interconnectedness in all elements of the world around us (Capra 1996; Sahtouris 2000). Thus there is a growing appreciation of the complementarity that exists between what were previously considered two disparate and irreconcilable systems of thought (Kawagley and Barnhardt 2004). The incongruities between western institutional structures and practices and indigenous cultural forms will not be easy to reconcile. The complexities that come into play when two fundamentally different worldviews converge present a formidable challenge. The specialization, standardization, compartmentalization, and systematization that are inherent features of most western bureaucratic forms of organization are often in direct conflict with social structures and practices in indigenous societies, which tend toward collective decision-making, extended kinship structures, ascribed authority vested in elders, flexible notions of time, and traditions of informality in everyday affairs (Barnhardt 2000). It is little wonder then that formal education structures, which often epitomize western bureaucratic forms, have been found wanting in addressing the educational needs of traditional societies. This is an excerpt from a longer paper which is available, along with many other excellent resources, on the Alaska Native Knowledge Network .